This is an extract from Derby by David Whish-Wilson and Sean Gorman. 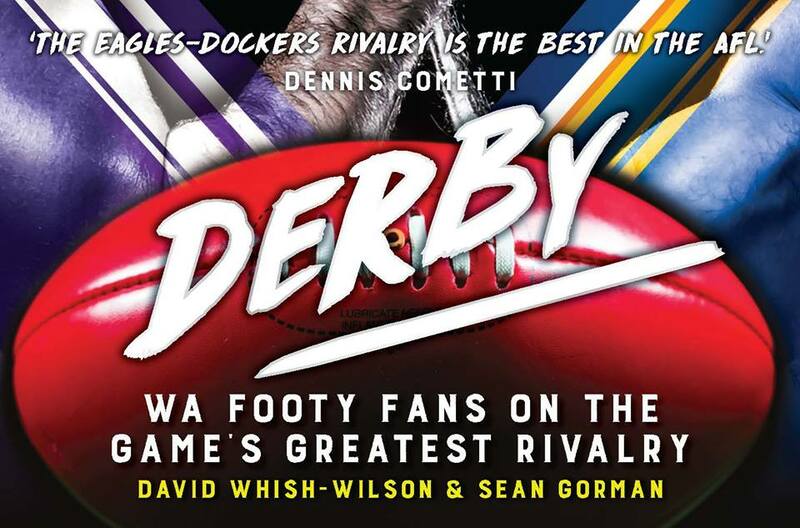 The book will be launched by Dennis Cometti this Saturday. All welcome. Details here. For David Selwyn Burralung Merringwuy Galarrwuy Wyal Wirrpanda, football has been good. Having played 227 AFL games for the West Coast Eagles, culminating in the one point grand final win over Sydney in 2006, Wirrpanda or ‘Wirra’ as he is more commonly known has worked hard to establish the Foundation that bears his name. In 2007 he was named by The Bulletin as one of Australia’s most influential Aboriginal people, and in 2009 he was awarded the Young Western Australian of the Year. Such was the power of his brand that he was a contestant on Dancing With the Stars, and he even had a tilt in the 2013 federal election as the National Party’s Senate candidate for Western Australia. At his North Perth home we are not only greeted by Wirra but two employees and old Docker adversaries in Dale Kickett and Troy Cook. The banter ensues about derby rivalry and games won and lost, but Wirrpanda focuses on what he first thought of the derby, having come from Victoria where he had witnessed hundred-year-old hostilities first hand. Asked to describe how Wirrpanda and his teammates prepared for a big derby game, he replies, ‘I know people like Dean Kemp really set himself for a big day with the derby. Brett Heady was another one. Glen Jakovich used to really fire up. Non-stop talking, geeing us up. Some blokes would spend the entire morning spewing up. I was relaxed, if anything too relaxed. Sometimes it used to annoy Woosha that I was a little bit too laidback. But I’d try to avoid that pressure of thinking about it a lot. I’d sit in the spa just before the game, have a yarn and a laugh. I wanted to make sure I was not wasting any energy and could come in fresh. But as soon as the siren went I’d go one hundred miles an hour.’ Apart from trying to calm himself before a big match, Wirrpanda’s other concern before a big game was ‘making sure my family had tickets. A few times in the warm up, our boot-studder at the Eagles would walk in and say we have you got your family here, and they want tickets, and I was literally just about to run through the banner. That was the thing that I used to stress over more. So I would make sure there was always a few spares at the door, because I didn’t want them coming in to the change rooms humbugging me just as I was running out.’ During the week in the lead up to a derby game Wirrpanda often spent time training with Phil Matera as he prepared for playing on his toughest Fremantle opponent – The Wiz. Congrats on the book Sean and David. I remember that Wirra and Shaun Mac clash very well. They both had their eyes on the ball – Wirra going back and Shaun running toward it. Sort of like the Woosha-Tony Modra collision (without the malicious intent). I was away for the Demolition Derby. Is “Mad Dog” Dale K in the book about hitting everyone in the Demo Derby? Clive Waterhouse – Commetti’s fave? I remember watching the Balla’s narrow miss from the boundary in the dying minutes after we had thrown away a solid lead in a recent Derby. It must have been a Dockers home game as I saw it on TV. Funnily my strongest Derby memory is a young Nat Fyfe running toward the northern pocket boundary line at the City End and looking over his shoulder for a 90 degree snap from 30 metres out. We were directly in line with the kick as it went straight through the middle, and I remember his quick look to size up the situation and the goals as he gathered the ball. Said to AE “this Fyfe kid is class – wish he was ours”. Yours in enmity until Saturday night. PB.